Shanghai, China, May 9, 2016 /ChinaNewswire.com/ - The Westin Bund Center Shanghai, today announced that it has been selected as a premier partner of 2016 TEDxShanghai. For five days, the hotel will become home to over 30 speakers and performers from China and around Asia and the world. As home of TEDxShanghai 2016, the hotel will be filled with organizations and individuals wanting to share their local TED-like experiences sparking deep discussions and connections. This year TEDxShanghai will strike a poetic balance between dualities be it science and art; artificial intelligence and humanism; past and future; by interconnecting opposites to create and foster long-lasting collaborative dialogue. Among the many speakers are Magda Sayeg, a fiber artist and founder of the yarn art movement. 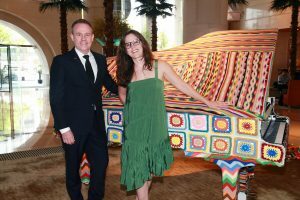 One of her installations can be seen at the hotel's lobby draped over a piano. “We are proud to have been chosen as home for the 2016 TEDxShanghai. At Westin, we focus on delivering, revitalizing and energizing experiences. We act as expert partners in helping our guests feel their best by striking the right balance,” says Greg Findlay, General Manager of The Westin Bund Center Shanghai. “With the introduction of the Westin Well-Being Movement, we've featured innovative partnerships and programs across Westin’s six pillars of well-being: Sleep Well, Eat Well, Move Well, Feel Well, Work Well and Play Well – to inspire guests to discover new approaches that promote well-being at Westin and beyond,” he added. The hotel's partnership with TEDxShanghai also seeks to bring the dialogue on striking a balance to a wider stage, both in the hotel and online. An after-event cocktail will also be held at Heavenlies on May 7th. The event will be held on Saturday May 7th, 9 am at the Shanghai Tower Pudong with a live audience of over 2,000 and live streaming across China, Asia and other countries with over 100,000 audience. Over 23 speakers and performers will take centerstage.